For veterans looking to purchase a home the loan program offered by the VA can be an excellent option to secure a mortgage. The VA loan program offers qualified veterans the ability to secure a home loan at a low interest rate, and for little to no down payment. This makes the program extremely attractive to many veterans. There’s a lot that goes into a VA loan, but one of the lesser understood aspects is the VA loan closing costs. Closing costs is sort of a catch all term that describes the variety of expenses due at the final phase of a home purchase. This includes things like an origination fee, attorney fees, and monies due to real estate ages. All mortgages will have fees like this, but the difference with VA loan closing costs is that certain costs cannot be paid for by the buyer. It’s important to understand which costs fall into this category as they will then likely need to be paid for by the lender, seller, or the agent. Closing costs will typically range anywhere from 1-5%. This varies depending on the location and home. Talk to your lender or agent to get an idea of where they might be for your purchase. 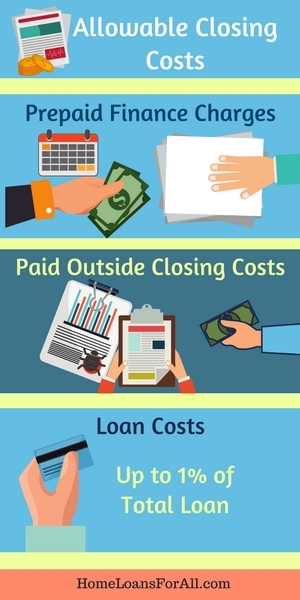 It’s important to understand the variety of closing costs as even a few percent of the loan can end up being thousands of dollars. 1.Escrow payments for interest, property taxes, or homeowners insurance. 2.Points used to buy down interest rates. 4.Any sort of applicable homeowners association fees. 2. Pest inspection fees (some are non-allowable depending on location). Loan Costs: Lastly, there are a series of costs that are associated with the loan itself. The biggest is typically the origination fee, which is a fee that the lender charges for processing the loan. This can be up to 1% of the total loan. 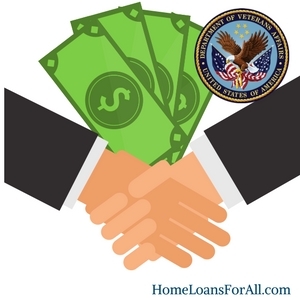 For VA backed loans, you’re also required to pay what is known as the funding fee. This is a fee paid directly to the VA to offset the cost of running the program. It’s typically a couple of percent, but can be rolled into the loan itself. Outside of the above, there are a number of VA loan closing costs that cannot be paid by the buyer. These are specific costs the VA has said the buyer cannot pay, and therefore must be picked up by one of the other parties. Attorney Fees: Attorney fees for either the seller or lender cannot be paid for by the buyer. Document Preparation Fee: Any sort of fee charged by the escrow company for preparing the documents cannot be paid by the buyer. Courier or Postage Fees: In some cases, specific documents might need to have special shipping conditions met such as being overnighted. Any sort of fees related to this cannot be paid by the buyer and need to be covered by the lender. 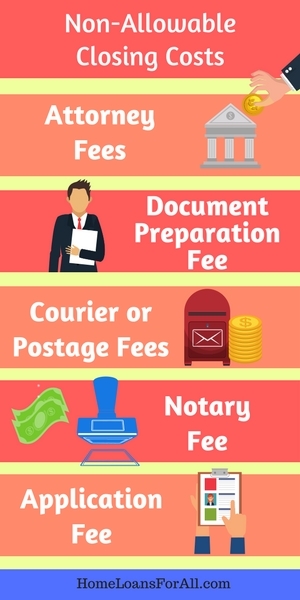 Notary Fee: Any sort of fee required, typically by the escrow company, to send a notary to the borrower when signing the mortgage documents is also non-allowable. Application Fee: Some lenders sometime charge a fee upfront before a potential borrower is able to apply for a loan. This is not allowed on VA loans. No VA approved lender should be charging any sort of up-front or application fee for VA backed loans. For each of these, allowable and non-allowable, the list is non-inclusive. There may be additional fees that fall into either category depending on where you live or the specific lender you’re dealing with. For example, some high-risk areas require a termite inspection as part of the appraisal process. In the majority of states, this inspections cost is not allowed to be paid by the buyer. Situations like this make it a good idea to work with a lender and agent that have experience with VA loans in the area where the home is being purchased. They’ll be able to provide more details on the fees, and any sort of special situations you might find yourself in. In the case where the seller pays for the closing costs of a loan it is called a seller concession. Concessions for the seller are negotiable, and they can choose to pay some not at all depending on the specifics of the deal and how motivated of a seller they are. On VA backed loans, seller concessions are limited to 4% of the total price of the loan. This means that a seller can only cover that much in closing costs for the buyer, after that the VA deems this to be excessive concessions. This limit is imposed to prevent a large concessions from hiding an above market selling price. This helps the VA and the lender reduce their risk in the transaction. 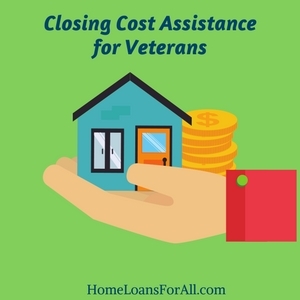 For those veterans looking to come up with the necessary monies to pay for allowable closing costs, there are a couple of options available. The first, and most obvious, is to simply to talk to the lender and seller and see what sort of deal might be worked out. Many sellers understand there’s a certain amount of give require to push a deal through, and may be able to pick up some of the closing costs. If under the concession limit, there’s nothing wrong with going back to seller and asking for them to pay some or even all of the closing costs. In addition to getting help from the seller, there are also a number of grants offered through the VA and private organizations aimed at helping veterans acquire housing. For example, the Pentagon Federal Credit Union offers the dream makers grant which provide assistance for down payments and closing costs to veterans. For veterans that require special accommodations due to disabilities, the specially adapted housing grant can provide up to half of the purchase price or a new home or renovating an existing property. The grant does have some strict requirements, and does have a cap on monies, but is a great option that can be used to help cover closing costs for those that qualify. There are also a wide range of state and local grants available to a wide range of home buyers that can also help cover parts of the loan. Searching for grants in your area is a great way to help cover closing costs. For example, in Texas first time veteran home buyers may be eligible for the Mortgage credit certificate program. This gives a tax credit of up to $2,000 on interest paid on the mortgage. 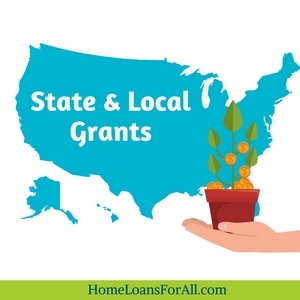 You can also speak to your lender or agent, as they can likely point you in the right direction to determining if you’re eligible for any local grants. The VA loan is an excellent option for veterans, and limiting the closing costs that buyers are required to pay makes them even more attractive. Having knowledge of which closing costs are non-allowable can help make the entire process smoother. It’s also smart to work with an agent who understands the VA process, as they can help you understand the various closing costs and how they will affect the overall price of the loan. Cash to close refers to the amount of money needed to be brought to closing. This includes all of the closing costs, as well as any down payment for the loan. 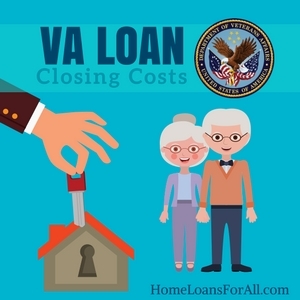 Can the VA Loan Closing Costs be Rolled into the Loan? Other than the funding fee, all closing costs must be paid at closing and cannot be rolled into the cost of the loan. How Much Are CLosing Costs on a VA Loan? As closing costs are typically a percentage of the total loan it’s impossible to give a specific dollar amount. That said, VA loan closing costs will usually run around 1-5% of the total loan amount, with borrowers instructed to plan for 3-5% to prevent surprises.